WELCOME TO YOUR NEW HOME FROM HOME! That’s it!  It’s finally time to head off to uni and start an exciting new chapter in your life. 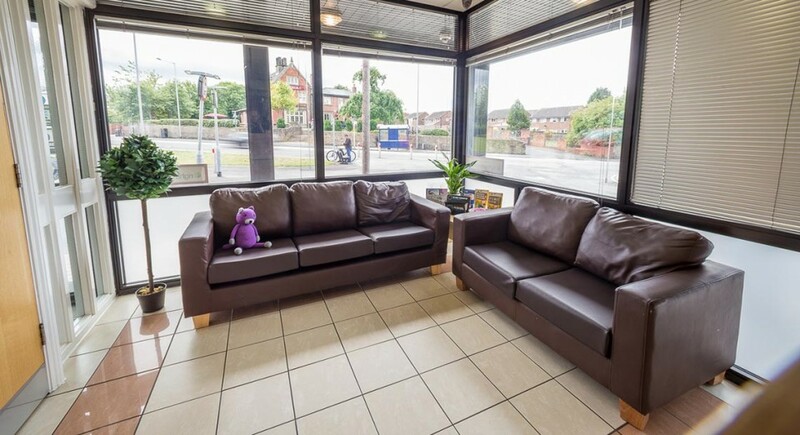 You might be feeling a mixture of emotions; anxiety, excitement, worry, uncertainty are all perfectly normal, but rest assured that the team at Warehouse Apartments, best student accommodation in Preston is ready to welcome you with open arms. As the best student accommodation in Preston we want your first few hours, weeks and months at uni to be the best that they can be so we’ve put together a quick check-list to help you make friends with your house mates and secure some of the best friends you’ll have for the rest of your life. 3) Host a welcome party – it sounds silly as you’re all living together, but if you invite everyone to meet in the common room with a few beers in tow then you can all meet each other at the same time and on neutral territory. It’s also a less intense way of getting to know each other. Drinking games are optional! We know that you’re first year can be incredibly daunting; you’re in a new city in a new living space and studying something you’ve never studied before. But believe us when we say that your first year will be unforgettable, even if some events are better off kept secret! You’ve chosen to study at university, you’ve booked your new home from home at Warehouse Apartments, UCLAN student accommodation and now you’re nervously waiting the arrival of your exam results. No doubt you and your mates will be going back to college or sixth form to collect your results together, but what if you don’t get the grades you need? Many students find themselves in this situation each year and the best thing to do is not to panic. 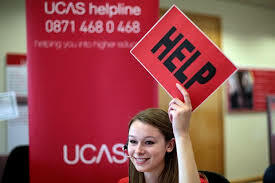 There are still options available to you through clearing. Clearing is no way something that only failures use and in fact some students change their mind over the university they want to go to or even the course they want to study, so it really is a fantastic resource for all. If you’re off to uni for the first time in September then no doubt you’ve got a ‘to-do’ list as long as your arm that needs completing before you make the big move. The third biggest decision facing freshers (after deciding which uni to attend and which course to study) HAS to be where you’re going to live. Chances are it’s the first time living away from your parents so ideally you want somewhere that’s like a home from home. Luckily for you we’ve got some awesome apartments for you to choose from at Warehouse Apartments, our student accommodation site in Preston. 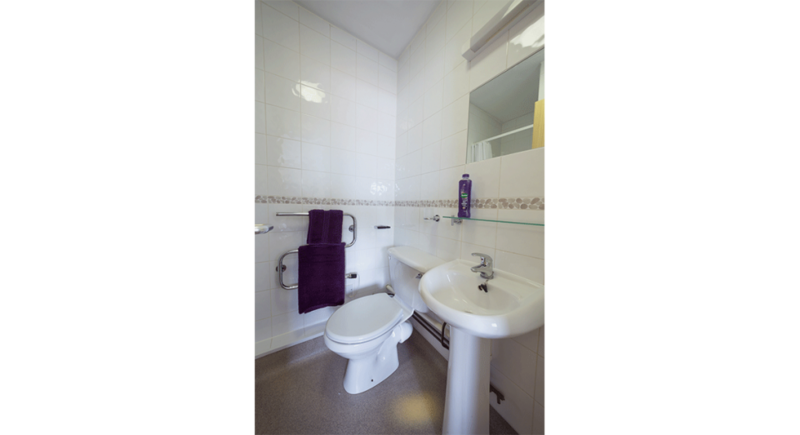 Warehouse Apartments has a mixture of 4,6 and 7 bedroom apartments for you to kick back and relax in. 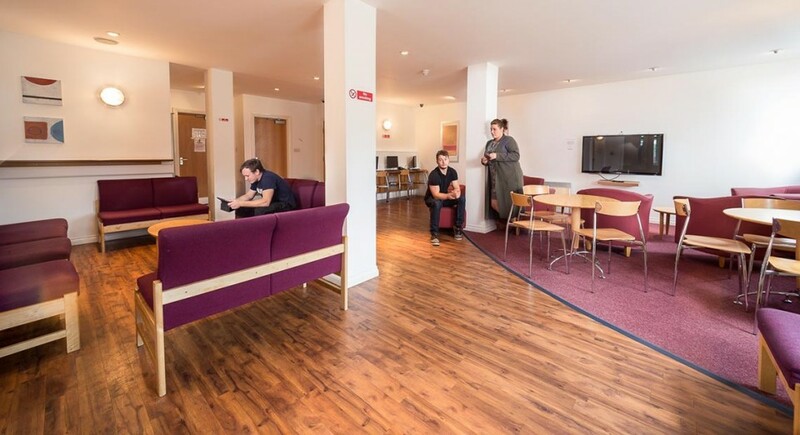 Each bedroom has a desk, double or three-quarter bed, fitted furniture and en-suite bathroom you’ve also got the choice of socialising in the lounge. Complete with 32” TV or in the on-site common room that boasts a 50” TV. 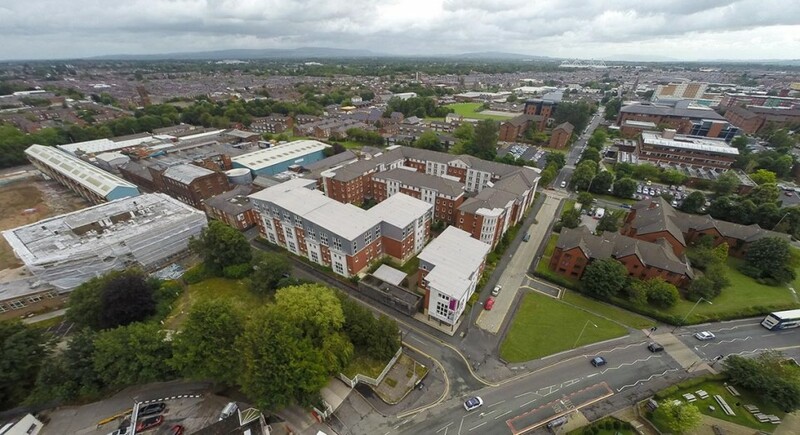 Just a few minutes walk from the main UClan campus with its buzzing Student Union, Warehouse Apartments offer everything you could possibly want or need. 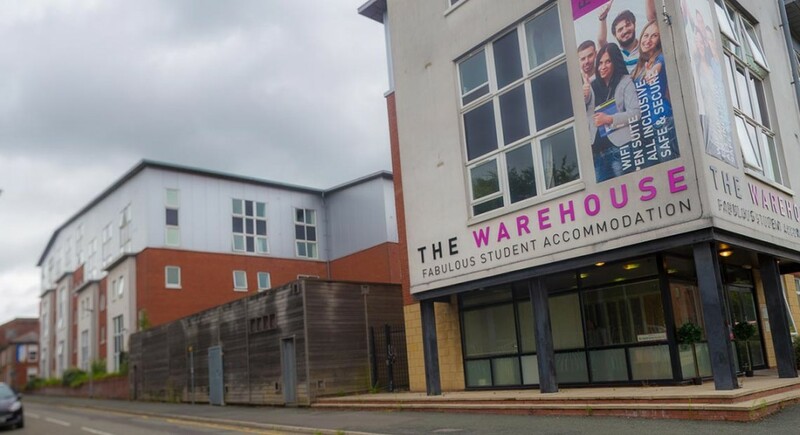 At Warehouse Apartments you’ll also benefit from 24/7 security, high speed broadband in every room, a dishwasher and onsite laundry room, giving you more time to enjoy all that uni life has to offer. 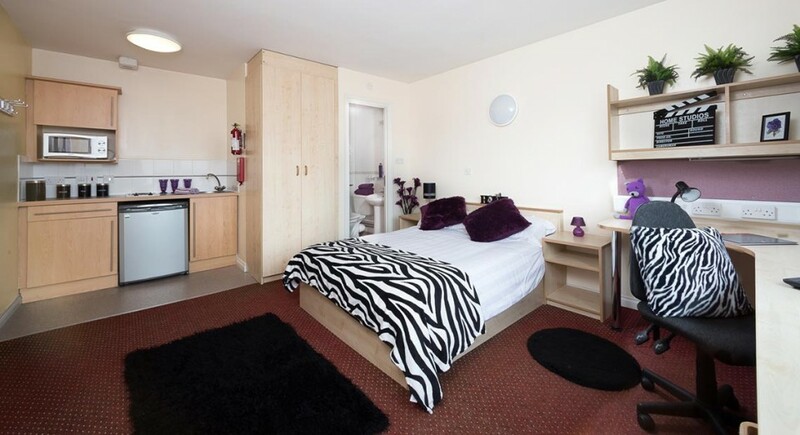 Your university years are some of the best years of your life, so get off on the right foot by choosing the right accommodation for you. 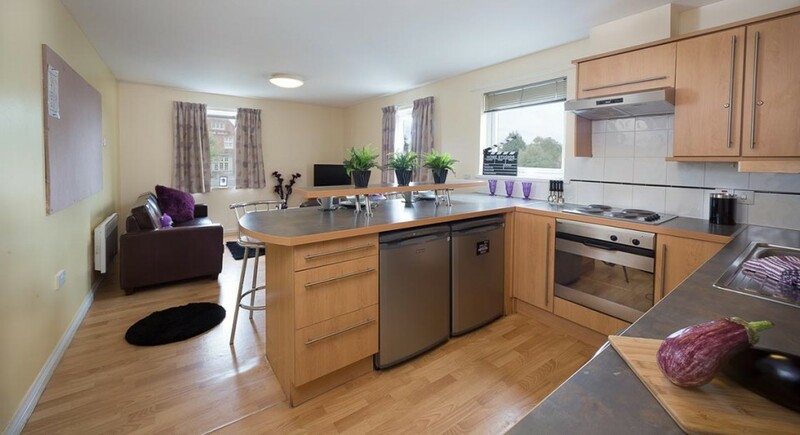 If you’re returning as a second, third or fourth year student and have left it far too long to book accommodation for the next academic year – what are you waiting for?? Luckily we still have apartments available, so don’t delay, get in touch with us today to arrange a viewing or put a deposit down on your chosen accommodation. Simply call us on 01422 825026 or email us at hello@studentfm.co.uk. Or why not check out our social media pages www.Facebook.com/thewarehouseapt or @thewarehouseapt on Twitter. Love it, Hate it, Rate it! 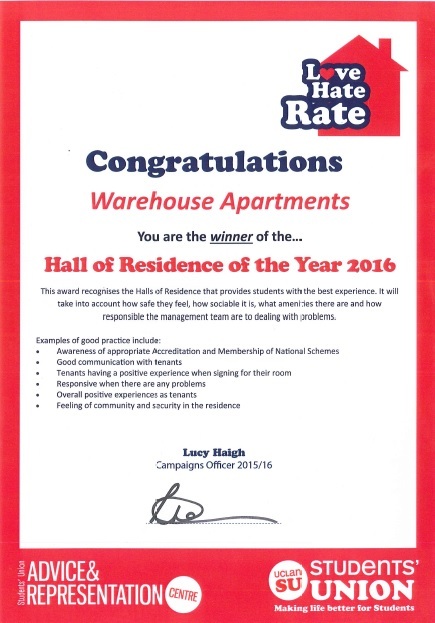 We are pleased to announce that The Warehouse Apartments has been awarded ‘Hall of Residence of the Year 2016’ as part of the University of Central Lancashire’s SU award scheme ‘Love it, Hate it, Rate it’. 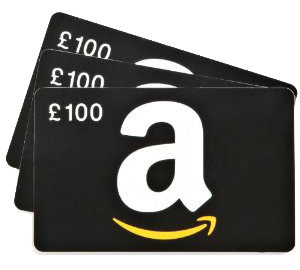 This award scheme allows students all over the Preston campus to anonymously rate where they live as well as provide the SU feedback on their experiences. As a company we endeavour to make every student experience one they will remember forever. It is important to us that all our students are happy and feel safe in the environment we provide and it seems our hard work is paying off. As the manager of The Warehouse Apartments, it has been great privilege to see the reputation of the accommodation grow and now to receive recognition from those that live here makes all our hard work worth it. I would personally like to thank all the staff that work ‘behind the scenes’ for their support as they too have contributed to the hard work we have put in. It is a great honour to be shortlisted for the award let alone win it. We would like to say a huge thank you to everyone that voted for us. 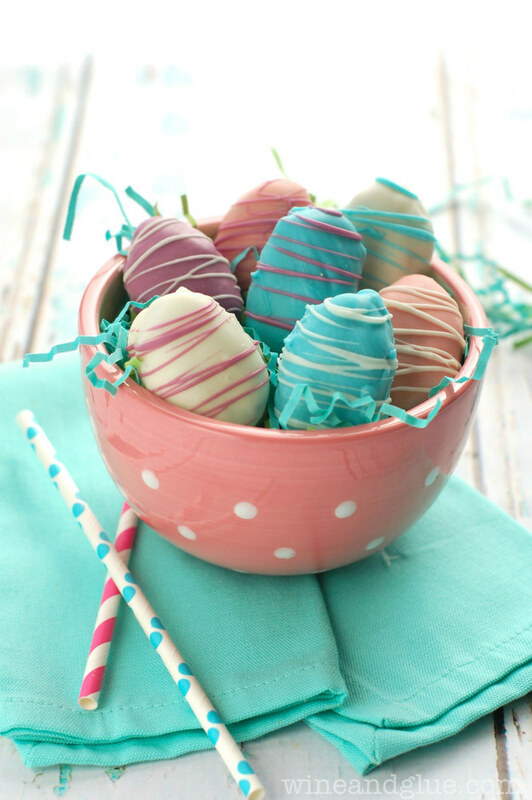 With Easter coming up this weekend, we’ve looked at a few ways in which you can turn your Good Friday into a Great Friday with these (excuse us..) cracking recipes! 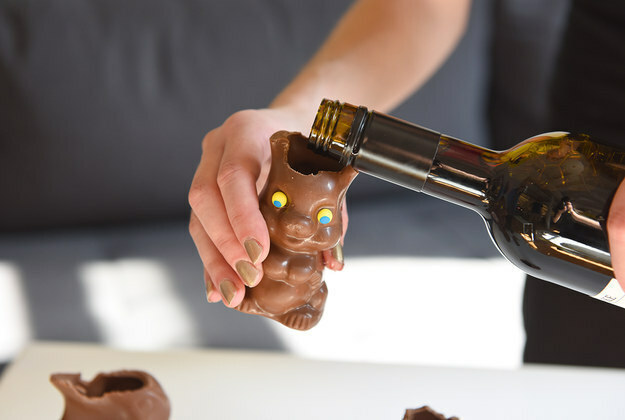 Even though that’s a mini Creme Egg, not a giant cocktail glass… It’s basically vodka with creme de cacao, Galiiano, ice cream and chocolate sauce. I hope you feel as nauseous as I do. Check out the recipe right here! Got a Malteaster Egg you can’t quite stuff down you? Bash it up with some Digestives and throw it in a tray with a melted syrup and margarine, and refrigerate. Et voila – tray bake! Recipe right here! No shame. None at all. Meditation has seen a rise in popularity recently. Going from what was once viewed as a bit ‘hippy dippy’ to something that everyday people are turning to, to help improve their mind, body and soul. 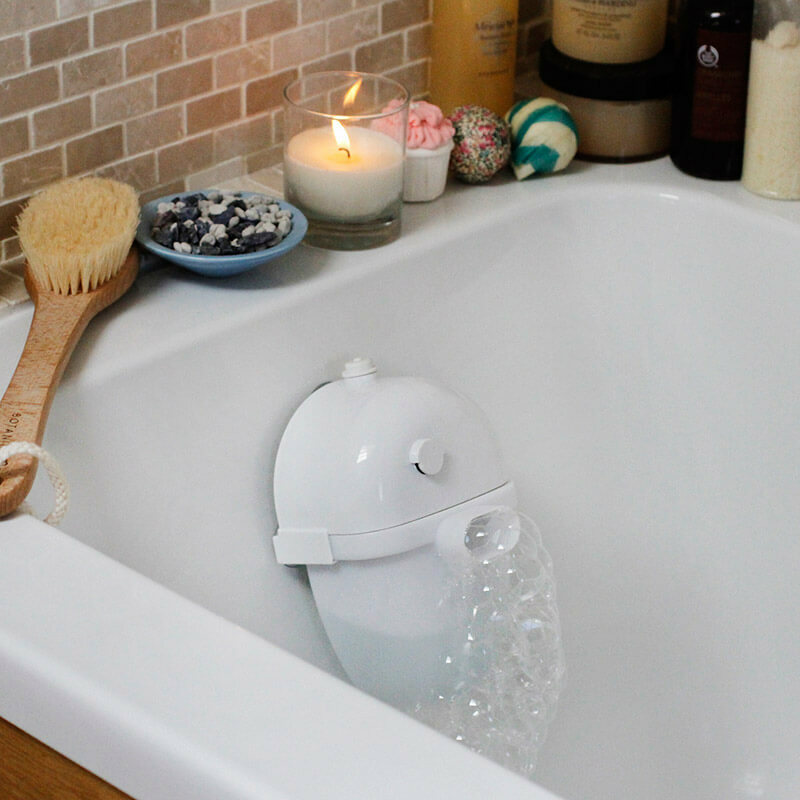 Many celebrities use it in their everyday lives from media mogul Rupert Murdoch, comedian Russell Brand and film director Martin Scorsese, to model Gisele Bundchen, actress Cameron Diaz and talk-show host Ellen De Generes. So if it’s good enough for them then it must be good enough for us too, right? As outsiders looking in we can kind of understand how we’d benefit from meditating, but surely there’s a certain level of being out of your comfort zone that we first need to overcome? Being in a room full of strangers and opening yourselves up to an alternative approach to health and wellness is quite brave but we’re sure the positives far outweigh the negatives. We’ve found a really insightful article on The Art of Living website that explains the benefits of meditation that we wanted we’d share with you, to show you why you should give it a go. There are physical and mental benefits to meditation along with other benefits too. Meditating can help you overcome emotional stress or even transform you as a person and your entire outlook on life. It’s a powerful force to be reckoned with and we can’t wait to find a meditation class in our local area. Why not give it a try and let us know how you get on. So you’ve been at university for a while now but you may still be finding your feet when it comes to discovering who the ‘real you’ is. Some people know who they are and exude a confidence that makes you feel even more inadequate because you still haven’t got a clue. Others silently get on with it, burying their heads into the studies and pretend that they’re in control. But what if both of these types of people are feeling the exact same emotions as you. Questioning if they fit in, if they’ve chosen the right course or even if they want a career in their chosen subject. Being at university can be tough on everyone at difference stages. Whether it’s your first year or your final year there are still unanswered questions and feeling that you’re not sure how to interpret. Which is why you may find the following article interesting. It may even provide that ‘eureka!’ moment that you’ve been waiting for, to help sum up what you’ve been feeling for ages. Have a read and see if you can relate to any of them and if you’re left thinking ‘oh my god, I totally thought that’ then you’ll now know what you need to do to get out of that mindset. Each of us is different. It’s what makes us human, but we all go through the same thoughts, feeling and emotions, it’s just how we choose to deal with them. The day is nearly upon us where Cupid comes out of hiding with his bow and arrow of love, but not everyone gets that warm, fuzzy feeling when the 14th February approaches. Shops are filled with love tokens to exchange with your partner, or prospective partner (if all goes well), whether it’s slushy cards, big fluffy teddy bears or heart-shaped boxes of chocolates. Luckily this some brands have bucked the trend and invested in a range of anti-valentine’s cards to send to your not-so loved ones. So, however you’re thinking of celebrating this weekend from a house party, themed party at the student union bar or drowning your sorrows in front of a soppy film and a box of tissues, remember to have a sense of humour and take the day with a pinch of salt. It’s just an excuse for us all to spend money on commercialised items we don’t really need after all! Welcome to The Warehouse. How can I help you today?